Corporations and Organizations Help American Red Cross Build Safer and Stronger Communities - Disaster Restoration Services, LLC. DRS is proud to support the Red Cross! November 16, 2016 — Corporations and organizations from across our state have partnered with the American Red Cross to help build safer and stronger communities. Red Cross annual giving opportunity programs, including Annual Disaster Giving, Disaster Responder and Ready 365, provide ways for organizations to partner with the Red Cross to support our humanitarian mission, and stand with us as we provide lifesaving services to our community and our military families. Contributions through these programs enable the Red Cross to prepare communities for disasters, respond whenever and wherever disasters occur and help families during the recovery process. The Red Cross has responded to three times more large scale disasters during the first months of 2016 than the previous three years combined along with helping at the scene of hundreds of home fires and other smaller disasters every day. 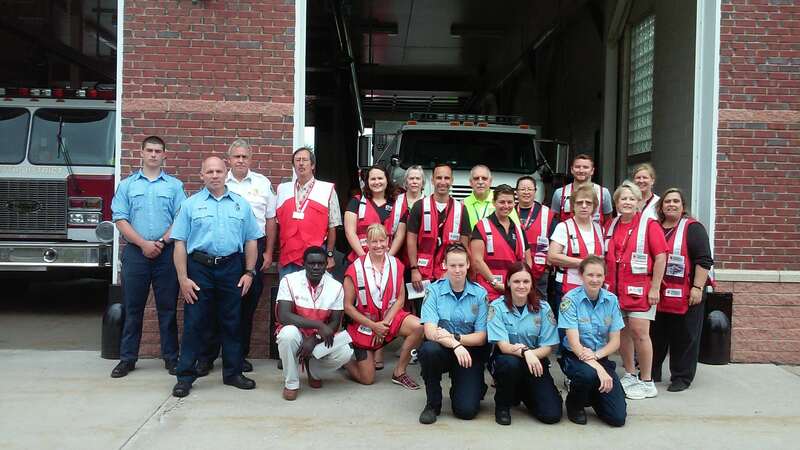 Locally, last year the Red Cross responded to more than 1,000 local disasters in Connecticut and Rhode Island – most of them residential fires. Since the beginning of 2016, the Red Cross has provided disaster relief all over the country, including blizzards, floods, tornadoes and many other types of disasters. Large disaster responses have included the destructive floods and tornadoes in Texas, the water crisis in Flint, Michigan, and torrential rains and flooding in Missouri, Mississippi, Texas and Louisiana and most recently, a five state response for Hurricane Matthew. The current members of the Red Cross Connecticut and Rhode Island Region Annual Giving Programs are: Annual Disaster Giving Program: United Technologies Corporation and National Grid, Disaster Responder: Starwood Hotels & Resorts Worldwide, Ready 365: Wells Fargo, O.F. Mossberg & Sons, Pitney Bowes, Legrand, NA, Amica Insurance, Cartus, Cigna, CVS Health, People’s United Community Foundation, The United Illuminating Company, Robinson + Cole LLP, ServiceMaster Restoration by Wills and Disaster Restoration Services. Organizations interested in helping the Red Cross stand ready in the face of disasters, please visit:http://www.redcross.org/local/connecticut/donate/ready-365 for annual giving program opportunities. The American Red Cross shelters, feeds and provides emotional support to victims of disasters; supplies about 40 percent of the nation’s blood; teaches skills that save lives; provides international humanitarian aid; and supports military members and their families. The Red Cross is a not-for-profit organization that depends on volunteers and the generosity of the American public to perform its mission. For more information, please visit redcross.org orcruzrojaamericana.org, or visit us on Twitter at @RedCross.